“Don’t stand for it! #danceforit”. 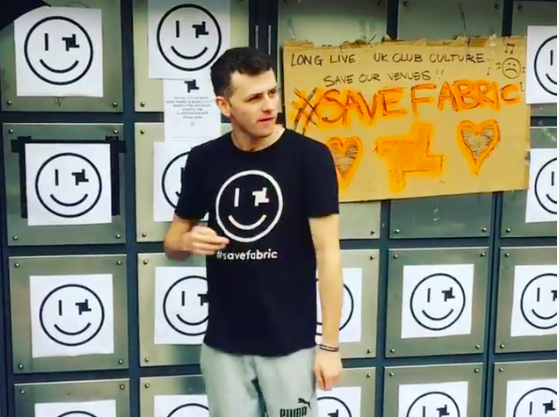 Fabric’s Save Our Culture campaign was so successful, the club raised £253,141.01 to fund an appeal against Islington Council who revoked the institution’s license in September following drug-related closures. But Fabric devotee Tim Griffith is using his endurance to help raise even more money for the club’s legal funds – he’s dancing underneath their marquee for 24 hours straight in hopes to raise £2,000. Griffith has been dancing since 12PM GMT and has already made half of his goal. He’ll only taking breaks from dancing to use the restroom and has insisted no one turn his fundraising into a party so that the Met doesn’t shut his efforts down. Read more about Griffith’s plan to dance for 24 hours in the name of London nightlife and watch a clip of his dancing, if you can call it that, below.